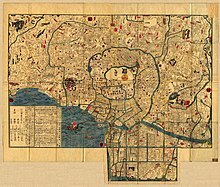 This article is about historical Tokyo. For other uses, see Edo (disambiguation). "Yeddo" redirects here. For a town in Indiana, USA, see Yeddo, Indiana. The northeastern corner of the city was considered a dangerous direction in traditional onmyōdō (cosmology), and is protected from evil by a number of temples including Sensō-ji and Kan'ei-ji. Beyond this were the districts of the eta or outcasts, who performed "unclean" work and were separated from the main parts of the city. A path and a canal, a short distance north of the eta districts, extended west from the riverbank leading along the northern edge of the city to the Yoshiwara pleasure districts. 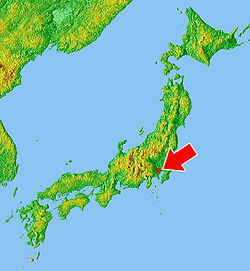 Previously located near Ningyocho, the districts were rebuilt in this more-remote location after the Great Fire of Meireki in 1657, as the city expanded. ^ a b c Sansom, George. A History of Japan: 1615–1867, p. 114. ^ US Department of State. (1906). A digest of international law as embodied in diplomatic discussions, treaties and other international agreements (John Bassett Moore, ed. ), Vol. 5, p. 759; excerpt, "The Mikado, on assuming the exercise of power at Yedo, changed the name of the city to Tokio". ^ Ponsonby-Fane, Richard. (1956). Kyoto: the Old Capital, 794–1869, p. 327. ^ a b c Ponsonby-Fane, p. 328. ^ Encyclopædia Britannica (1911): "Japan: Commerce in Tokugawa Times," p. 201. ^ Deal, William E. (2007). Handbook to life in medieval and early modern Japan. New York: Oxford University Press. ISBN 0195331265. ^ Taxes, and samurai stipends, were paid not in coin, but in rice. See koku. Gordon, Andrew. (2003). A Modern History of Japan from Tokugawa Times to the Present. Oxford: Oxford University Press. ISBN 0-19-511060-9/ISBN 978-0-19-511060-9 (cloth); ISBN 0-19-511061-7/ISBN 978-0-19-511061-6. Sansom, George. (1963). A History of Japan: 1615–1867. Stanford: Stanford University Press. ISBN 0-8047-0527-5/ISBN 978-0-8047-0527-1.